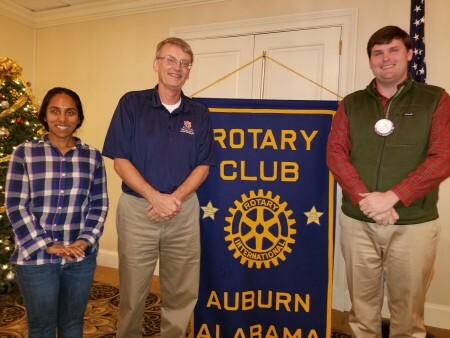 On Wednesday, Dec. 20, the Auburn Rotary Club hosted Bashira Chowdhury (left), director of the Bee Biodiversity Initiative at Auburn University, and Charles Ray (center), a research fellow with the Alabama Cooperative Extension System. They spoke to Rotarians about their research into preserving the populations of honeybees and other pollinators. Pictured with them is club Secretary Tyler Adams (right). The Auburn Rotary Club meets each Wednesday from noon to 1 p.m. at Saugahatchee Country Club. For more information about the Auburn Rotary Club or how to become a member, visit www.auburnrotaryclub.com.